"Rick and Morty forever a hundred times! Over and over, rickandmortyadventures.com. www.rickandmorty.com. Www.rickandmortyadventures.com. All 100 years. Every minute, rickandmorty.com." 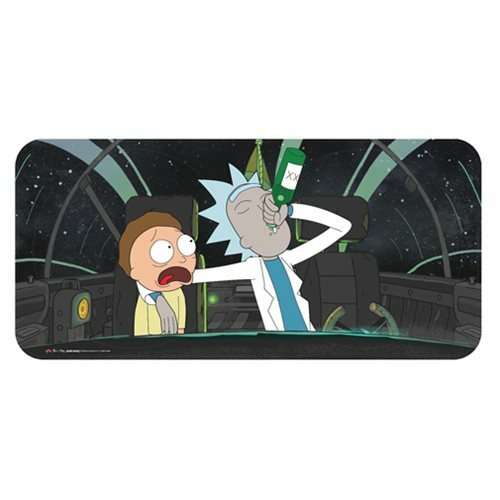 Keep the adventures going with this Rick and Morty Space Cruiser Drink Time Sunshade! This sunshade is accordion-style so you can open and close with ease when you need to visit another dimension quick. This Rick and Morty Space Cruiser Drink Time Sunshade fits most cars, vans, and trucks and blocks out harmful UV rays. Measures about 57-inches long x 28-inches tall. Ages 14 and up.